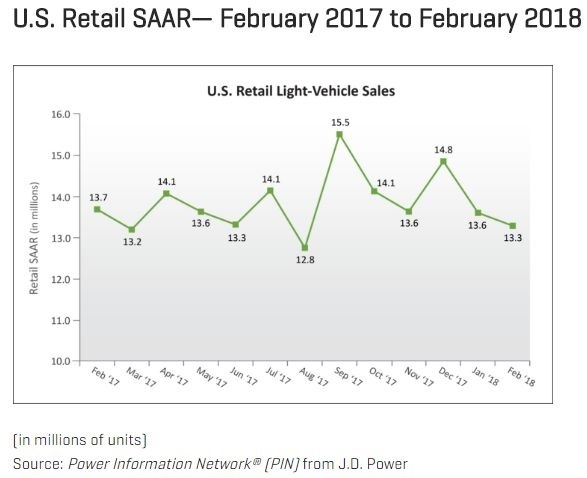 DETROIT — February’s seasonal adjusted annual rate for retail new-vehicle sales is expected to fall by 400,000 from a year ago to 13.3 million units, according to the latest forecast from J.D. Power and LMC Automotive. The two firms put total retail sales at 997,300 units, which would represent a 3% decrease from a year ago. Average incentive spending through the first three weeks of February stood at $3,840, down $14 from a year ago. The decline, said Thomas King, senior vice president of J.D. Power’s data and analytics division, is particularly notable given that incentives have risen consistently since 2013, with spending in December rising by more than $400 from the prior period. “The industry is expected to deliver mixed results in February, with a decline in retail sales volume, higher transaction prices and the potential for the first year-over-year drop in incentive spending in more than four years,” King added. However, the decline is due to reduced spend in select segments of the industry, specifically, trucks and SUVs offered by domestic manufacturers. Incentives on domestic trucks and SUVs have fallen $450 month to date. In contrast, incentives on nondomestic trucks and SUVs have risen $482 and spending on all cars is up $80. While rising transaction prices for the industry overall and reduced spending in some segments of the market is a positive indicator for the long-term health of the industry, sustaining lower levels of incentives will be challenging, according to the two firms. They believe a “considerable potential” exists for spending to rise at the end of February and in the months ahead. They noted, for example, that the $450 decline in domestic truck and SUV incentives has coincided with a significant drop in market share for those vehicles. In fact, domestics share of the truck and SUV market has fallen 3.2 percentage points to 49.2% this month compared to a year ago. The drop in incentive spending also impacted the average new-vehicle retail transaction process, which stood at a record $32,237 for the month of February. The firms noted that consumers are also on pace to spend $32.2 billion in new vehicles in February, just slightly below last year’s level. Additionally, incentives as a percentage of MSRP stood at 10.2% so far in February, exceeding the 10% level for the 19th time in the past 20 months. As for sales, trucks accounted for 67% of new-vehicle sales through Feb. 18, the highest level ever for the month of February and the 20th consecutive month above 60%. Additionally, the average number of days a new vehicle sits on a dealer lot before being sold to a retail customer was 70 through Feb. 18, which is flat compared to a year ago. Fleet sales are expected to total 306,500 unit in February, up 1.1% from a year ago. Fleet volume is expected to account for 24% of total light-vehicle sales, up from 23% one year ago. LMC’s forecast for 2018 total light-vehicle sales is just under 17 million units, a decrease of 1.4% from 2017. Retail light-vehicle sales are forecast to be 13.7 million units, a decrease of 1.7% from 2017.